Chances are, you have a container of hummus in your refrigerator right now. And chances are, it’s pre-made from the supermarket. There’s no shame in that! There’s a tub of the store-bought stuff sitting in my refrigerator too. With a handful of pita chips or carrot sticks, it’s a quick and healthy any time snack. Although I’ve served it at parties dressed it up with a drizzle of olive oil and a sprinkle of paprika. This is all to say that store-bought hummus is perfectly fine. But homemade hummus is unbelievably awesome. To make hummus, you only need a food processor and a few ingredients: tahini (sesame paste), lemon juice, salt, olive oil, garlic (if you like), and chickpeas. While you can use rehydrated dried chickpeas, canned chickpeas work just as well and don’t require you to plan ahead. 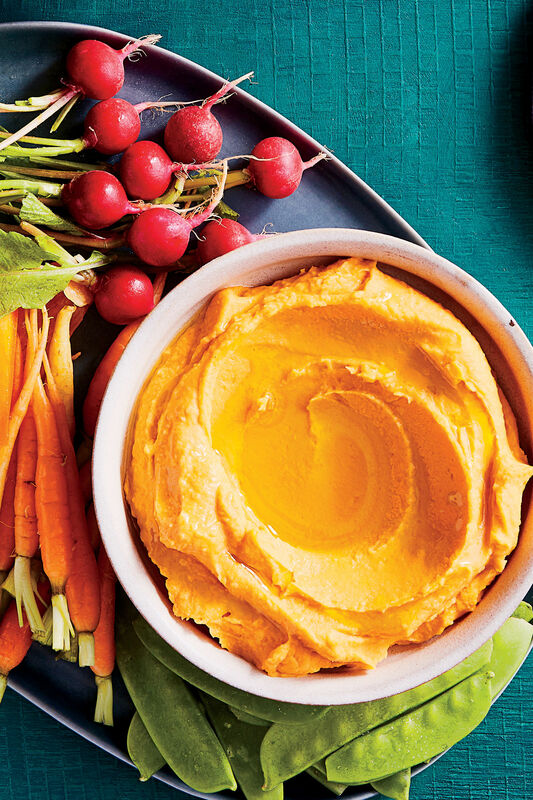 If you're feeling creative, you can flavor your hummus with other ingredients like carrots—or boiled peanuts! My favorite brand of chickpeas, and legumes in general, is Goya. They are almost always consistent in size, quality, and flavor—no mushed or greyish chickpeas in the bunch. Always rinse and drain them well before using them to make hummus, or any recipe. Remove and discard the chickpea skins for a smooth and silky texture. Those thin, fibrous skins won’t ruin your hummus by any means, but when they break down in the food processor, they add a little more texture to the dip. Yes, this is a little tedious, but it’s not as time-consuming as you might think.